(from page 5 of the 1994 Collection) Vibrant Red 1994 Mustang SVT Cobra convertible, rear view. All 1994 SVT Cobras had "Mustang" letters embossed on the bumper. (from page 5 of the 1994 Collection) Vibrant Red 1994 Mustang SVT Cobra convertible, rear left view. LEDs were used in the brake light incorporated into the rear spoiler. (from page 5 of the 1994 Collection) Left side view, Vibrant Red 1994 Mustang SVT Cobra convertible. 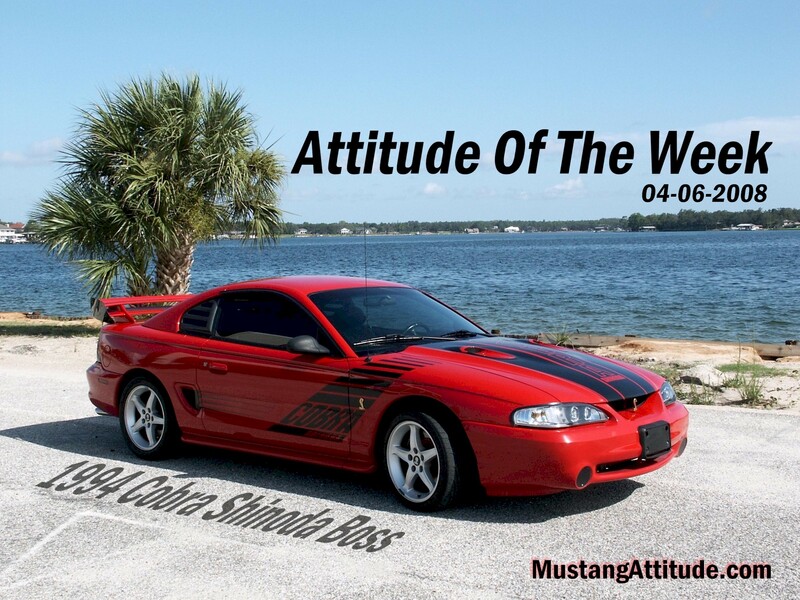 (from page 5 of the 1994 Collection) This Rio Red 1994 Mustang Boss Shinoda Cobra 429 coupe with a SVO 429 block bored 605ci with double electronic fuel injection, putting out 670hp at 5500rpm and 700 ft-lbs of torque at 4250rpm was our Attitude Of The Week for April 6, 2008. The compression ratio is 10.5:1 and the rear axle ratio is 2.73:1. 1994 was the first year Larry Shinoda set up a company to modify the Mustang GT and Cobra into the Boss and Cobra 429 Boss. Larry Shinoda was the designer of the original Mustang Boss back in 1969. This photo is available in two larger wallpaper sizes 1024 by 768 pixels and 2400 by 1800 pixels. (from page 5 of the 1994 Collection) Rio Red 1994 Mustang Cobra 429 Boss Shinoda coupe, front end view showing off the Shinoda hood graphics, custom headlights, and gold Cobra grille emblem. (from page 5 of the 1994 Collection) Left front view of a Rio Red 1994 Mustang Cobra 429 Boss Shinoda coupe with Shinoda rear spoiler, black rear quarter window panels, custom wheels, and Shinoda Boss hood and side graphics. (from page 5 of the 1994 Collection) 1994 Rio Red Mustang Cobra 429 Boss Shinoda coupe, left rear view.